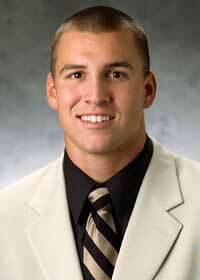 Northern Illinois senior quarterback Chandler Harnish has earned one of 16 spots in the 2011 National Football Foundation Scholar-Athlete Class, presented by Fidelity Investments, the National Football Foundation and College Hall of Fame announced Wednesday. The prestigious award provides postgraduate scholarships to an elite group of 16 players chosen from across all divisions of college football for their combined athletic, academic and leadership skills. Harnish, who already owns seven Northern Illinois career records, including many that stood for nearly 50 years, will receive an $18,000 postgraduate scholarship and represent the Huskies in New York City at the 54th NFF Annual Awards Dinner on Tuesday, Dec. 6, at the Waldorf-Astoria. He is also now a finalist for the William V. Campbell Trophy, which recognizes the top scholar-athlete in the nation and comes with a 25-pound bronze trophy and a $25,000 post-graduate scholarship. The Huskies’ signal-caller is one of only 10 NCAA Football Bowl Subdivision players to be named to the 2011 NFF Scholar-Athlete Class. The 16 recipients were selected from a pool of 127 nominees across all classes of college football. NIU head coach Dave Doeren, who is in his first season at Northern Illinois, said he was impressed with Harnish on and off the field from the start. “When I met with Chandler the first week I was on campus, I could tell he was so much further along than many guys his age,” Doeren said. “He knew what he wanted spiritually, he was set to graduate and already working on his master’s, and he had already made community service a big part of his life. All of those things that so many adults struggle with he has made a part of his life, and that allows him to be a better football player because he doesn’t have all those conflicts. In his fourth season as the Huskies’ starting quarterback, Harnish has led some of the most prolific offenses in school history. He currently ranks 14th nationally in total offense with an average of 304.4 yards per game, and while he is ranked 38th in the country in passing efficiency, he also ranks 39th nationally in rushing with 92.2 yards per game. 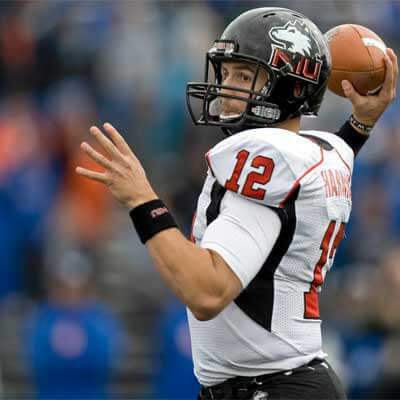 After setting the NIU records for career and single season total offense as a junior, when he led Northern Illinois to a school-record 11 wins, he has added the Huskie all-time marks for passing yards, pass completions and attempts and touchdowns responsible for while leading the offense to nearly 40 points per game as a senior. Harnish has twice been named the MAC West Offensive Player of the Week in 2011: after throwing five touchdown passes versus Army in the 2011 season opener, and after rushing for 229 yards and passing for 203 in a 55-21 win over Western Michigan. In that game, he became just the 10th player in NCAA FBS history to rush and pass for more than 200 yards in the same game. He has led the Huskies to bowl games in each of his three seasons under center and became the first Northern Illinois quarterback to earn first team All Mid-American Conference honors a year ago. Harnish earned his undergraduate degree in business management from Northern Illinois last May with a 3.65 grade point average and currently carries a perfect 4.0 GPA as he pursues his master’s degree in business at NIU. He is one of the Huskies’ team leaders in community service, spending time almost weekly speaking to youth groups and participating in outreach efforts throughout the area. The Bluffton, Ind. native who attended Norwell High School appreciated the opportunity to be recognized for his academic, as well as athletic, success. The NFF’s National Scholar-Athlete program, launched in 1959, is the first initiative in history to award scholar-athletes postgraduate scholarships for their athletic, academic and leadership abilities. This year’s class members finds themselves in good company, as past National Scholar-Athletes include former NFL standout Derrick Brooks (Florida State); actor Mark Harmon (UCLA); NASA astronaut Leland Melvin (Richmond); former Dateline NBC anchor Stone Phillips (Yale); chairman of Augusta National Golf Club, home of the Masters Tournament, Billy Payne (Georgia); famed NFL quarterback Steve Young (BYU); and Heisman Trophy winners Terry Baker (Oregon State), Gary Beban (UCLA), Doug Flutie (Boston College) and Tim Tebow (Florida). Harnish joined players such as Michigan State’s Kirk Cousins, Texas A&M’s Ryan Tannehill, Georgia punter Drew Butler and Purdue’s Joe Holland in this year’s Scholar-Athlete Class.